The question; "How do I add or switch accounts in Facebook Messenger?" is what people have been asking time without number. If you have multiple Messenger accounts, rather than logging out of the different accounts on a regular basis to access the other, you can switch between them from time to time. 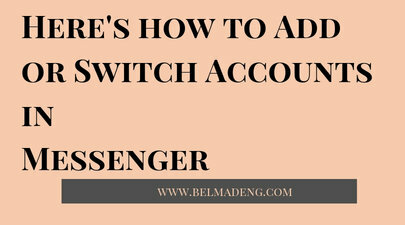 The Messenger app has a feature that enables its users to add and also switch accounts with ease. According to the Messenger Support Center, you can save different Messenger accounts and switch between them at will. However, when you add a new account, the password won't be saved in Messenger unless you opt out of requiring a password to switch to the account. This Messenger feature lets its users add up to 5 accounts. In this post, you will see how to add or switch accounts on Messenger via iPhones, Android, and iPad apps. For those of us that may wish to know, your Messenger account password is the same thing with that of your Facebook account. Peradventure you forgot your password, you can hover about Facebook to reset it. 1. Tap your profile photo in the top right. Bear in mind that if you can't add or switch accounts in Messenger that you may need to update your Messenger app.